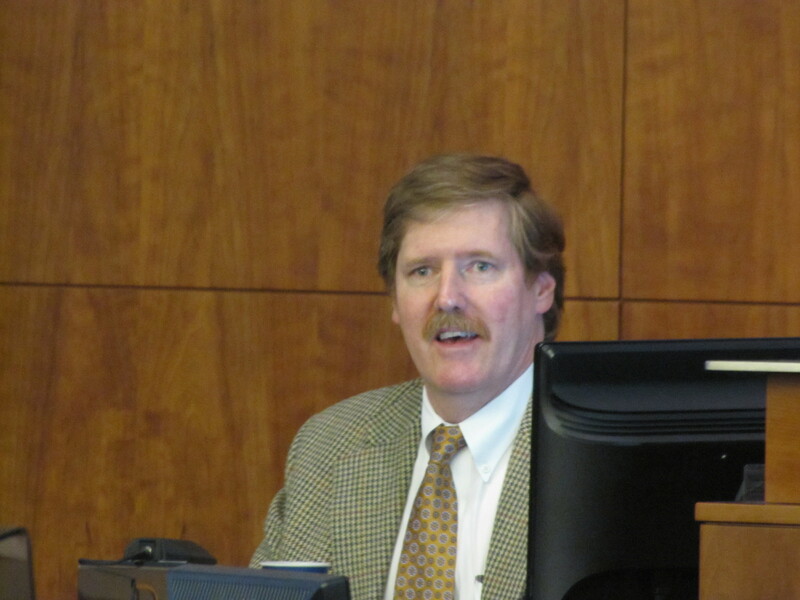 Dave Barry, an oil spill response trainer, gives testimony during a civil trial at Plymouth County Superior Court. PLYMOUTH, Mass.— The defendant in a class-action lawsuit involving Mattapoisett property owners opened its case Friday with testimony from an oil spill response trainer who helped manage the cleanup of up to 98,000 gallons of Bouchard oil that polluted Buzzards Bay on April 27, 2003. Dave Barry, president of Gallagher Marine Systems, told the jury he represented Bouchard as one of three members of the Unified Command team, which was charged with managing spill response and cleanup activities under the Oil Pollution Act of 1990. The team included a representative from the U.S. Coast Guard and another from the Massachusetts Department of Environmental Protection. Barry said his duties began the day of the oil spill when he received a phone call while driving across the Bourne Bridge with his wife and mother-in-law. He drove to the nearby Massachusetts Maritime Academy, where he had conducted oil spill response training workshops. At the academy, he hopped on a boat that carried him out to the Bouchard No. 120 barge, which had drifted off course and struck a submerged reef while transiting the narrow bay. Out at the barge, Barry learned that a father-and-son dive team had seen a gash in the vessel’s hull measuring about 3- to 4- feet wide and 12- to 15- feet long. “It was clear to me at that point that we had a real problem,” he said. For the next four months, Unified Command orchestrated cleanup activities along 90 miles of contaminated Buzzards Bay shoreline, including the Mattapoisett beaches for which plaintiffs in the 1,100-member class-action suit are seeking millions of dollars in damages from Bouchard. Using photographs, Barry described various cleanup activities performed at contaminated beaches, such as mopping up the thick, No. 6 fuel oil with towels, collecting and disposing oil-soaked rocks and washing oil off rocky beaches with high-pressure hoses. He said the cleanup work cost Bouchard about $36 million. Barry testified that Unified Command met its goal of making public and community beaches “available for the public to use” over the 2003 Memorial Day weekend, about a month after the spill. The team continued to manage oil cleanup activities through the summer, responding to hotline calls from residents who reported finding oil on their beaches. “You (can) have a beach that looks beautiful, but you can always go out and you might be able to find a rock that is oiled, or flecks of oil that get into crevices … It’s impossible to get every last bit of oil off the beach,” he said. Unified Command disbanded around Labor Day weekend in 2003, after beaches were inspected and reported to comply with cleanup standards, called the Immediate Response Action Treatment and Completion criteria. “We were very proud of the job we had done,” said Barry, who received a Coast Guard commendation for his work. Management of the site was turned over to a Bouchard-hired environmental consultant who facilitated additional cleanup activities as required under stricter state standards, Barry said. During cross examination, plaintiffs’ attorney Martin E. Levin asked Barry about the criteria inspectors used for cleaning semi-public beaches such as Leisure Shores and Brandt Beach in Mattapoisett. Barry confirmed that such beaches could pass inspection even if there was oil below the surface, a smell of oil and/or a “discontinuous” oil sheen appeared when a hole was dug in the sand. Earlier in the day, plaintiffs’ attorneys wrapped up their case with testimony from Kim DeLeo of 2 Marina Drive. DeLeo, who lives near Leisure Shores, is the class representative in the lawsuit. Prior to arguing its case, the defendant asked the judge to rule in its favor by making a motion for a directed verdict due to a lack of evidence by the plaintiffs against Bouchard. The motion was denied by Justice Raymond J. Brassard and the trial continued. The defendant will call additional witnesses when the trial resumes Monday at Plymouth County Superior Court.